I’m tempted to start a new category on the blog: what to do with your leftover x that you bought for Passover and is still in your fridge a month and a half later. This year it was the fresh horseradish that my family always uses. Think E.T. but with a mop of curly green hair. It gets grated into the jarred stuff that is served alongside a few pieces of gefilte fish at a Saturday morning kiddush. The thing about the horseradish is that I can’t stand it. That entire category of foods doesn’t agree with me (Why would you ruin sushi with wasabi? And you do realize they make poison from mustard?) I debated just tossing the offending root in the trash, but that seemed like a waste. So I went to my cookbooks. Luckily, it only took five minutes of searching until I was reading a pickled beets recipe that calls for fresh horseradish. It’s from Deborah Madison’s terrific cookbook, America: The Vegetarian Table, a book which has served me well in the past, but which I hadn’t opened in years. The recipe calls for two tablespoons of coarsely grated fresh horseradish, which I toned down to about a teaspoon and a half. And honestly, the recipe really did benefit from the root. It gave it a little heat and was a great counter balance to the warm spices: brown sugar, fresh nutmeg, fresh ginger and whole cloves. Madison points out that tiny garden beets, about the size of “large marbles,” are prettiest in this recipe. I used what was in my fridge, which were large ones. I simply peeled them, cut them into smaller pieces and steamed them before the pickling. I’ve served these alongside whatever we’re having for dinner: quinoa with arugula stirred into it; arugula sautéed with tons of garlic, strips of fresh red pepper and finished with golden raisins; roasted carrots topped with fresh dill; chunks of fresh avocado; eggs, boiled hard but with jammy yolks. Or, just grab a fork and the jar and have yourself an afternoon snack. 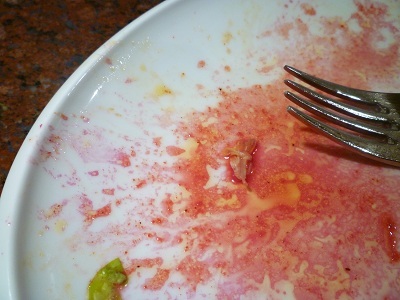 Trim the beets, leaving on ½ inch of their stems, and scrub them well. Or, peel and cut larger beets into 2-inch pieces. Steam them until tender but still a little firm, about 15 minutes. Let the beets cool. If the skins are tender looking and free of roots or coarse patches, leave them unpeeled; otherwise, peel them. Fit them into a clean quart jar. Combine the remaining ingredients in a nonreactive saucepan and bring them to a boil, stirring to dissolve the sugar. Pour the hot vinegar mixture over the beets, immersing them fully, Cover tightly and store in the refrigerator. They are best served after sitting for at least a day and will keep for one to two months. Sorry to disappear there for a few weeks. We’ve been sick. All of us. No real diagnosis, except the girls’ coughing still sounds pretty terrible, and we always need to have tissues close at hand for little noses. (Update: Lilli was up all night with what clearly is a stomach bug.) The best way to describe how I’m doing is that I sometimes feel hungover, which is pretty frustrating as I cut out all alcohol last year. The migraines aren’t worth it, but boy could I go for a gin and tonic this week. When I feel a cold coming on I cook up a different sort of tonic. It’s one from my childhood friend’s mom. This and her Salad Olivier are pretty essential to my life. My friend is originally from Latvia; I think her mom is from Lithuania, so I guess we can call it Baltic? Soviet? Eastern European? From the Old Country? Despite being tasty and having magical healing powers, it hadn’t occurred to me to even share it here. But I was reading one of my new cookbooks given to me over the holidays – Small Victories by Julia Turshen – and she totally shares her “Cold Elixir” on page 255! I skip the cinnamon and cayenne pepper and use lemon, instead. She makes a big batch of it then keeps it in the refrigerator for up to two days and heats it up as she needs it. I make mine one glass at a time, though I see the benefit of cooking up a large batch. But I promise you, if you drink this right when you feel a cold coming on, it stops it in its tracks. When I woke up last week feeling meh, I made myself a mug of this and settled down with a pile of my cookbooks. “Be careful, please,” Rich said as he saw me with a hot liquid and all the new books. Obviously I spilled my drink within 35 seconds of that. The books were fine, and Lilli actually jumped up from the couch, saying she would refill my glass. I heard her pushing her Kitchen Helper around the kitchen, turning on the faucet and collecting the ingredients; granted I was a little nervous for her to be using the microplane, but I knew she was psyched to use the reamer for the lemon. When she brought it to me, my heart basically melted all over the floor. It was quite possibly the best thing I’ve ever had in my life. I made her the same drink the following week, but skipped the vinegar because I thought it would be too bracing. Her reaction? “Yuck!” Which is the same thing her sister said when she licked the cat a couple days ago. But that’s another story. I measured this out so I could share the recipe here. As always, I recommend keeping your fresh ginger root in the freezer; just use a microplane to grate it into the hot water. If you have access to local honey, use it; among other things, like supporting a local business, you will be ingesting local pollen and lessening any allergies you might have to your surroundings. Combine the water, ginger, vinegar, honey and lemon in a mug and stir until the honey dissolves. Drink soon as it’s cooled down enough to sip. 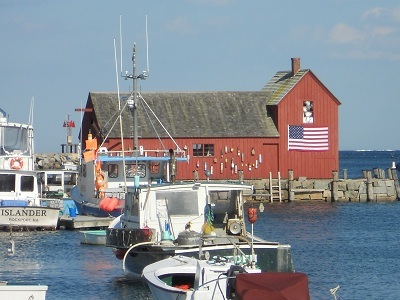 We had quite a busy Saturday this weekend, starting with a lovely afternoon on Cape Ann. 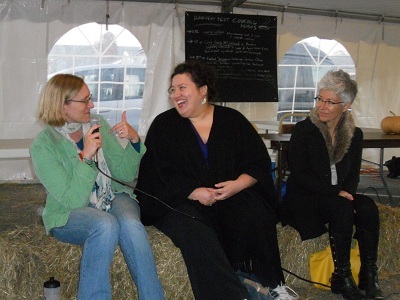 I shared a hay bale and a microphone with some really remarkable women to discuss eating locally at the Rockport HarvestFest. While we were there, we enjoyed lots of local treats like maple-covered almonds, fresh corn chowder and homemade pumpkin whoopie pies. Then we trucked it back to town for an evening of parties. First stop was our friends’ annual beer and cheese party. What started as a gathering of about two dozen enthusiastic beer geeks six years ago has blossomed into more than 75 people sharing their favorite pairings. In keeping with the local spirit, we brought a 2-year aged cheddar from Shelburne Farms in Vermont. We paired it with two versions of a saison, a spicy Belgian-style farmhouse ale, by new local breweries: Mystic Brewery in Chelsea and Backlash Beer Co. in Holyoke. 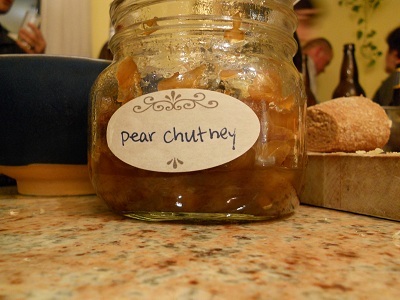 And although the most popular accoutrement at the party was a baby (another change over the six years), my special accompaniment was a pear chutney I churned up earlier this week. As I simmered my pears, I thought about how my attempt to prepare a locally sourced dish had ended up involving ground coriander from Asia and lemons from California. Of course, the vinegary relish is of Indian origin and is now the most popular condiment in the United Kingdom. Me, Maggie Batista, and Jane Ward. Not pictured: Heather Atwood. Our second party was a 30th birthday for a dear friend, and the chutney did double duty that night as a small gift for him. I had actually tagged this recipe last fall to use as little gifts for friends, but the season slipped by too fast for me. To make sure that doesn’t happen again, I have another half dozen pears resting on my dining room table, just waiting to spruce up anything from a serving of yogurt to accompanying a nice piece of fish. Peel and core the pears and dice them into small pieces. Put them in a heavy saucepan with the white sugar and place over low heat. Cook until they’ve released quite a bit of juice, 10 to 15 minutes. Stir them a few times while they cook. Drain off the juice and set the pears and juice aside separately. In a nonreactive pot, combine the remaining ingredients and bring to a boil. Add the reserved juice, lower the heat, and simmer until fine bubbles dot the surface, about 40 minutes. Add the reserved pears and cook over low heat until the pears are translucent and the sauce is quite reduced and thick, about 25 minutes more. Ladle into a clean jar, cover tightly and refrigerate. They are best served after sitting for at least a day and will keep for up to two months. Lately, I’ve been inflicting injurious harm to salads within my reach. Or, as Rich put it when he saw the mess on my plate at his brother’s wedding two weeks ago, “What did you do to your salad?” I looked down at my plate. The dressing was more of a lake on my little dish. A grape tomato floated in the liquid like a buoy. A piece of lettuce, like a water-bogged piece of driftwood, was sinking nearby. “I don’t know,” I replied, stymied. The following week, at a friend’s bridal shower, a similar fate happened to my salad there as well. I’ve tried to understand what went wrong; my guess is one shouldn’t apply salad dressing with a ladle. Or, I shouldn’t use a ladle, at least. This week was the start of Ward’s Berry Farm choose-your-own-CSA-box through my office. It couldn’t be simpler: I was given the option of ordering upfront for the entire season or going week-by-week, choosing whatever box tickles my fancy when it’s announced. And I couldn’t be happier. May and April were such a bust, produce-wise. I am still annoyed at the bunch of asparagus I picked up with glee last month at Russo’s, only to realize it was from California. So the idea that I can get a box of produce from the farmer who picked it, two blocks from my office, makes me so happy. This week’s box included two heads of lettuce: my shot at redemption for the wrong I did to those poor, unsuspecting plates of banquet salad. I intentionally kept the salad simple. I carefully cleaned the red leaf lettuce, gave it a spin in a salad spinner and ripped it into bite-sized pieces. I sliced up a cucumber, and then peeled and grated a beet. If you can, do it it with a food processor; it keeps things on the clean side. 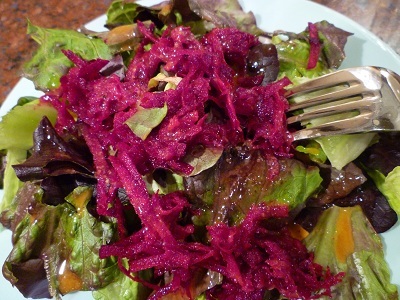 Then, I gently drizzled on this sunset-hued chile-cumin vinaigrette from Didi Emmons Vegetarian Planet. I modified the recipe just a touch. I found that the two teaspoons of honey made for a very tangy dressing, so I added a third. She calls for a mild red chili power: I used the Aleppo powder I picked up at Fairway last time I was visiting friends in the city. Toast the cumin seeds in a small, dry skillet, shaking the pan often, until they release their aroma. Grind the seeds in a spice mill. In a blender or food processor, blend the garlic, mustard, cumin, chili powder and honey to a paste. Pour the vinegar and oil into a bowl. With the blender or processor running, slowly pour the vinegar-oil mixture into the paste. When all of the vinegar-oil mixture has been incorporated, add salt and pepper. Store the dressing in a covered container in the refrigerator. It will keep for up to 3 weeks.